Craig Scott probably wishes the fixture planners could find Peterborough Phantoms a game every Wednesday night. One month on from hitting a hat-trick to book the city club’s place in the final of the English Premier League Cup, the Anglo-Canadian frontman repeated the feat last night (February 17) to ensure Phantoms’ challenge for title glory remained on track. Scott was the headline contributor in a 5-3 triumph over Manchester Phoenix at Planet Ice last night in a typically frenetic clash between these two sides. Emerging talent James White helped himself to the other two Phantoms goals. The teams’ previous two meetings on Bretton ice this season had produced 11 and 13 goals respectively, so the final game in the series was relatively low-scoring in comparison. It certainly wasn’t short on entertainment though. 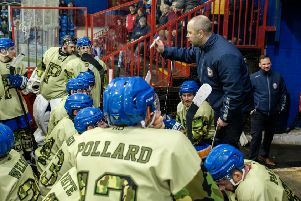 It was seriously open – “a bit too open for my liking at times,” in the words of Phantoms coach Slava Koulikov – from start to finish with a combined total of 84 shots unleashed on goal. But, crucially, it ended in victory as second-placed Phantoms remained four points behind table-toppers Basingstoke, who triumphed 4-2 in their first-versus-third trip to Milton Keynes. Koulikov said: “We played well without always being in total control of a game which was full of opportunities for both teams. “But I’m just happy with two points against a very cunning and dangerous team who move the puck quickly and well, and have some deadly imports. “But we showed we are capable of scoring goals and taking chances ourselves. It was great to see Craig come up with another hat-trick, but the whole of the team chipped into the performance. “It is also good to see James playing with confidence and scoring goals. He is a young kid who still has a lot to improve on, but he is making good progress and helping the team keep picking up wins. The scoring of some generally well-crafted and well-executed goals put Phantoms in the ascendancy (a scruffy, scrappy fourth from White being the exception to the rule) while the concession of a couple of soft strikes kept Phoenix in contention. Scott made the first breakthrough in the final second of the opening minute when burying a Milan Baranyk pass at the back post, but Manchester levelled when a Martin Baranek shot through traffic deceived netminder Janis Auzins. Parity proved to be short-lived – just 35 seconds to be precise – as White expertly finished in a one-on-one situation after being released by Will Weldon’s pass following some fine defensive graft from Lloyd Gibson. Scott extended the advantage before the first break when gobbling up a Marc Levers rebound and the cushion was increased further in the second session when White forced the puck through Phoenix netminder Steve Fone following a big scramble in front of the visitors’ net. Manchester replied within a minute as Auzins could only divert a Robin Kovar shot into the path of Mark Thomas for the most gift-wrapped of tap-ins before Baranyk saw a penalty shot saved by Fone in the final minute of the stanza. It looked like that could be costly when Manchester slashed their arrears further as Baranek ruthlessly finished a quick breakaway early in the final period. But Scott slammed in a smart Levers pass from beyond the net to complete his latest treble and only the pipes prevented Ales Padelek from providing a more emphatic margin of victory. Phantoms had already done enough though to continue their hot streak and ensure the pressure on EPL pacesetters Basingstoke remains cranked up. Swindon on Saturday (February 20, 5.45pm) is the next stop for Koulikov’s men. They’re back on home ice the following night (February 21, 5.30pm) to take on reigning champions Telford.